To access one form from another you need to include the unit of the accessed form in the uses section of the other form. The next topic will have a demonstration of four forms linked together. The steps to link a main form to a password form are given below. We keep it simple, and do not encrypt the password (or make it difficult to guess). If you go wrong you can look at the essential code of five files after the instructions. Create a new application and save the unit as uPassword.pas and the project as Password.dpr. Open the form and add a button (tool-tip TButton) from the Standard tab of components and two labelled edits (tool-tip TLabeledEdit) from the Additional tab. Rename the components by changing in the Object Inspector the Name properties of the form, button and labelled edits to frmPassword, btnMain, leName and lePassword respectively. 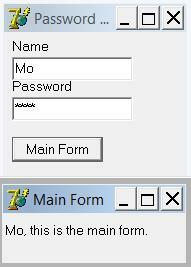 Using the Object Inspector, change the Caption property of the form and button to Password Form and Main Form, respectively. Using the Object Inspector for the first labelled edit, click on the + to the left of EditLabel then change the caption of the EditLabel to Name. Using the Object Inspector for the second labelled edit, change the PasswordChar property from #0 to *. Click on the + to the left of EditLabel then change the caption of the EditLabel to Password. Add a new form to the project using the menu item File > New > Form. Using the menu item File > Save As ..., save the unit of the new form as uMain.pas. Using the Object Inspector, change the name of the form to frmMain and its caption to Main Form. Resize the forms and position the components to your satisfaction. Run the program and enter 'Mo' for the name and 'pp4s' for the password. Click the button to see something like this screenshot. The essential code for the files follows.